GAZA-ISRAEL BORDER - Hurling pipe bombs and setting off firecrackers, "Night Disturbance Units" have become a new phenomenon on the Gaza-Israel border in the run-up to the first anniversary of deadly border protests. Organizers say the intention of the night-time events is to fray the nerves of Israeli military lookouts and to lower morale in Israeli villages along the 30-mile frontier. With loudspeakers blaring patriotic music into the dark, the dusk-till-dawn demonstrations began small and escalated in recent days, ahead of a massive protest rally expected at sites along the frontier on Saturday. "We come at night to prove to the occupation that we do not fear your weapons, they should fear us," said one 20-year-old Gazan undergraduate. "We burn tires, hurl stones, make noises using firecrackers. Why should our people suffer alone, they should suffer too," added the protester, who would not give his name, fearing Israeli reprisals. 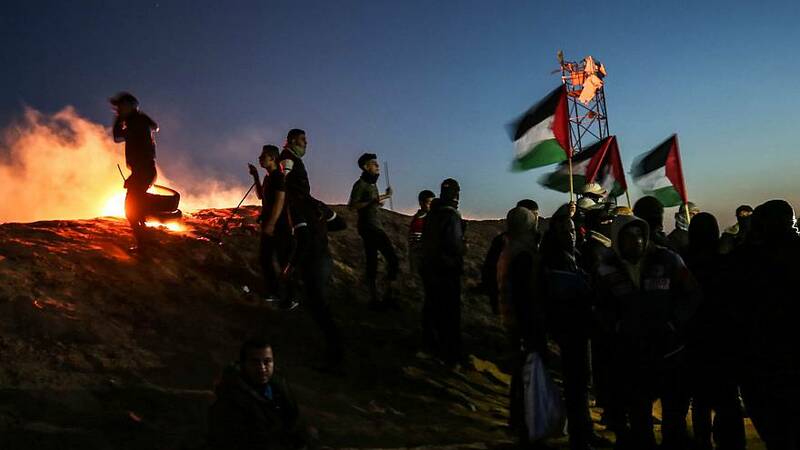 Although scores of Gazans attend, the night protests are not as big as in the daytime. In the dark, the demonstrators cannot see far as they face off against Israeli security forces firing tear gas, rubber bullets and live ammunition. Last Sunday a 24-year-old man died after being wounded by Israeli gunfire overnight, said Gaza health officials. The Israeli military said explosives had been hurled at the fence that night, and its forces "struck two Hamas posts in response". Israeli troops have killed nearly 200 Palestinians at the weekly border protests, which began on March 30 last year, and have wounded thousands more. Israel's lethal response has been criticized by human rights groups, who say it is targeting protesters who pose little threat to heavily armed soldiers. U.N. investigators said last week that Israeli forces may be guilty of war crimes for using excessive force. Israel rejects the criticism, saying its troops are defending the border against rioters, and it has no choice but to use lethal force where necessary. Israeli commanders say they are protecting the residents of nearby Israeli towns, who live in fear of Palestinian rockets and militant infiltrators. "We hear the bombs they throw at our soldiers every night - hundreds of bombs, hundreds of explosions," said Yifat Ben-Shushan, a bleary-eyed mother of two from Nativ Haasara. Her border village has endured years of shelling attacks by Hamas, but she described the nightly commotion as disruptive on another level. "A child does not know how to tell the difference between a rocket or someone throwing a bomb," she told Reuters. "I have two children, (and) rise two or three times a night to make sure they are still in their beds." 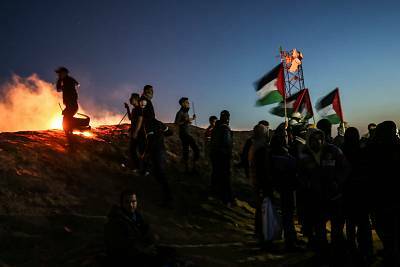 The Gaza protesters are calling for the lifting of a blockade imposed by Israel and Egypt, and for Palestinians to have the right to return to land from which their families fled or were forced to flee during Israel's founding in 1948. The blockade, imposed for security reasons after the militant group Hamas took control of Gaza in 2007, has reduced the densely populated coastal strip to economic near collapse. Israel says the protests are backed by Hamas, which uses them as cover for attacks on the frontier. On Friday Israel's Foreign Ministry said that in the past year Hamas had fired 1233 rockets from Gaza, set off 94 explosive devices and set fire to more than 8,000 acres of Israeli land near the border. Security in the south is expected to be an important issue in Israel's April 9 election, when right-wing Prime Minister Benjamin Netanyahu faces a strong electoral challenge after a decade in power. Israel and Hamas fought three wars from 2007-2014 and have come close to all-out conflict several times since. The past week saw a major escalation in cross-border fighting after a Palestinian rocket fired deep into Israel wounded seven people. There were no large-scale protests planned for Friday. With Israeli tanks massed on the border ahead of the anniversary, Palestinian officials said Egyptian mediators were to meet with protest organizers to urge that Saturday's rally be peaceful.